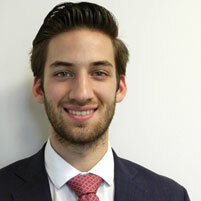 David Matvey (DC’18), an international relations and politics major with an additional major in ethics, history and public policy, spent the past semester in Washington, D.C., taking classes and interning in a senatorial office. He recently told the Department of Philosophy’s e-newsletter about his experience and how he's preparing for a career in international relations. Tell us about your academic experience at CMU and in the Philosophy department. The philosophy courses I have taken thus far at CMU have corrected my misconceptions about what philosophy really looks like in purpose and form. Although it's a very theoretical field, ethical theories can be broken down into understandable processes for trying to explain objective morality, should it exist. You're just finishing up with participation in the Washington Semester Program. What did you love about that experience? The Washington Semester Program provides students with a unique opportunity to experience American politics firsthand by interning in D.C. and meeting with numerous high-level political figures, such as agency directors, heads of lobbying firms and military officials. There is no set of classes or opportunities at the Pittsburgh campus that could ever compete with the experience in D.C. It is an absolute must for anyone interested in exposing themselves to the range of possible careers in public policy, government, law and, increasingly, the tech and business industries in D.C. Personally, the Washington Semester Program will be the most memorable and beneficial experience in my academic and career memory because it was such a uniquely strong introduction to the world of public policy. Tell us specifically about your internship experience in D.C. I interned at the Office of Senator Bob Casey from Pennsylvania. The internship gave me an intense inside look to the operations of Capitol Hill and taught me the real ins and outs of how policy is formed. The relationship between constituents, representatives, lobbying agencies, government agencies and the private sector is much easier to understand when you are surrounded by the community that engages in policy making as a career. What other activities are you involved in at CMU? I have held three positions in Activities Board since my freshman year, currently serving as one of the AB Concerts chairs in charge of the Fall Concert and the Spring Carnival Concert. I am a member of Greek life, a volunteer with PACE and recently became the president of CMU Club Lacrosse. As of now, I would hope to work with an international government relations team between French and American private firms and then go on to law school to study international corporate law. What is your advice for incoming first-year students at CMU? Is there anything you would go back and do differently? It is as important to hit the ground running, staying ahead in classes and exploring your major(s)/minor(s), to explore your interests and do things that just genuinely make you happy. Do things that interest you, and try new activities/organizations but don't stretch yourself too thin. Becoming a diverse individual means doing things that improve your personal happiness, not your resume.